Evening rainbow, Black Hills, USA. All rainbows are beautiful, but very few of them are bright enough to look good on photos. Here are some of the best (or unusual) rainbows I've seen. Rainbow, Sewilleta National Wildlife Refuge, New Mexico. Nat'l Park, South Dakota. Crow Indians called the Great Plains "the country of big sky". It is one of the World's best places to watch thunderstorms and rainbows. More tornadoes and supercell thunderstorms occur here than in any other part of the planet. The peak season is late April to early July, and the average date with most tornadoes is May 17, that happens to be my birthday. Since my arrival to the US, I try to celebrate my birthday in the Tornado Alley (part of the Plains between Omaha, Nebraska and Lubbock, Texas) each year. I took this picture a few minutes after a very strong June thunderstorm (HP supercell) with lots of rain, hail and wind. There were no tornadoes, but after the cloud had passed, I was awarded with such a beautiful sight. In mid-summer, thunderstorm activity spreads from Tornado Alley to the far northern and western parts of the Plains. This spectacular July thunderstorm in Alberta produced little rain, but lots of beautiful cloud formations and rainbows. Supercell thunderstorms are also known for large hail, sometimes melon-size, so it's better to chase them in a rental car with good insurance coverage. Spring rainbow, Tum, Altai. In the Old World, one of the best places to see rainbows is in Altai Mountains. The meteorological crossroads of Eurasia, Altai gets summer rains from all directions, and rainbows can be seen almost daily from mid-May to early August. Thunderstorms are more severe in the foothills, but more regular in the high mountains of Central Altai. 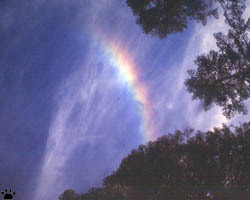 Rainbows are less common in tropics, because there the sun is too high overhead during most of the daytime. Still, if you are in the mountains, you sometimes can see the rainbow by looking downhill. Mornings and evenings are also good times for tropical rainbows, especially in "wet" mountains of Hawaii, Central America, Southern China, the Sundas, and Central Africa. This unusually bright rainbow was visible for more than an hour during a pleasant warm February shower. Baobabs in a thunderstorm, Zombitsi National Park, Madagascar. South from the tropical latitudes, rainbows become common again. They are often very bright in spring, probably due to constant freezing and melting of raindrops as they move through different layers of cold air. The Arctic also gets it share of rainbows, but they are rare here, and seem bright only relative to the tender colors of the North. The good thing is, they can be very long-living, just as Northern sunsets and sunrises, a photographer's dream come true. This charming rainbow was seen one June midnight in Yukon Territory, Canada, just north from the Arctic Circle. It lasted for more than two hours, and moved slowly along a mountain range, as the sun circled the sky on the other side of the horizon. Rainbow over Richardson Mountains, Canada. October rainbow, Central Labrador, Canada. This rainbow above the Trans-Labrador Highway was unusual because it appeared at a very low temperature - well below freezing. It was accompanied by light hail. Apparently there was a sharp temperature inversion just a few hundred meters above the ground, so the rain droplets didn't freeze until falling into the layer of cold air. Some rainbow-like things you see in the sky are not rainbows at all. 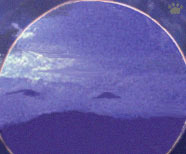 Halos, for example, are formed when sinlight gets through thin cloud layer. Unlike rainbows, they are usually seen more or less on the same side of the sky with the sun, not the opposite one. Depending on cloud composition, halos can form either a full circle around the sun or the moon, or two, sometimes four, sundogs - bright spots on both sides of the sun ("sun's mittens", as they are called in Siberia, where people believe them to be a sign of a frosty night coming). Here is an excellent page about halos and similar phenomena. Halo on cirrus clouds, Badger Pass, California. Iguazu, Argentina When the sun is very low, the atmosphere sometimes filters away all colors, except red, as can be seen in this pink rainbow. Pink rainbows are very rare, and they usually turn into multi-colored rainbows (if the sun is rising) or disappear in less than one minute. Triple rainbow, Iguazu, Argentina. Finally, about 30 minutes after sunrise, the sunlight gains all colors, and rainbows become complete with blue and purple. In the middle of the day, the tropical sun is high overhead, and the rainbows you can see in large waterfalls are sometimes very bright and beautiful. Niagara Falls, USA. To see a moonlight rainbow (also monochromatic), you need dense clouds of water droplets - such as in high surf or large waterfalls. 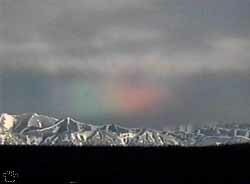 Very rarely it can be observed in the sky after rain, but in this case it is not so bright. Street lights can also produce small yellow rainbows. A good place to look for moonlight rainbows is in Yosemite, California - here the waterfalls are all around the valley, and you can choose the one with the optimal orientation relative to the position of the moon in the sky. Rainbows produced by waterfalls are usually less bright than some of rain-associated ones, probably because water droplets are too small. 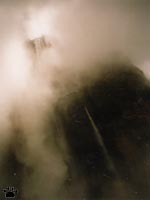 But some waterfalls also send large volumes of large droplets in the air, as the water falls on rocks or canyon walls. 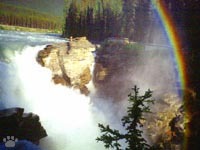 Many waterfalls in Banff and Jasper National Parks in Alberta, Canada, are located in narrow canyons, and rainbows can be very bright at the times when the canyons are in sunlight. Athabaska Falls, Jasper Nat'l Park, Canada. Salto Anjel, Venezuela. The most beautiful place to look for rainbows is the south-eastern part of Venezuela, sometimes called Guyana Highlands. Hundreds of waterfalls, many of them more than half a mile tall, drop from the cliffs of the famous tepuis - spectacular mesa-like mountains. In windy days, only big ones make it to the forest below - all water from others is carried away. Anjel Fall is the tallest (more than 1 km), and the most beautiful waterfall on Earth. If you are lucky to get there in a sunny day after a rain, you can see dozens of rainbows as the river flies down through layers of clouds and fog. Swimming suit is the best clothes for such a visit - you'll get soaked anywhere within a mile from the waterfall. This rainbow was hovering inside a small, vapor-producing crater in the middle of a very dry lava desert. The colors were unusual, probably because some wave lengths were absorbed by volcanic gases. 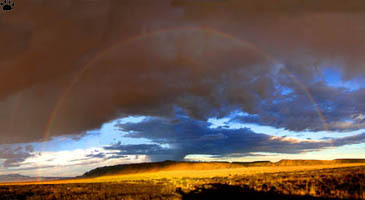 In addition to the rainbow, the crater was inhabited by endemic moisture-loving ferns and millipedes. Monterey Bay. Another unusual place to look for rainbows is in whales' spouts. You need to get close to see them - 20-30 meters (60-100') is usually the optimal distance. Monterey Bay, California, is one of the best places to do so. Powerful bush-shaped spouts of humpback whales are usually the best for rainbows, but tall spouts of blue whales or weak spouts of gray whales can also produce some. One summer day I was caught in a sudden thunderstorm while hiking up West Spanish Peak in Colorado. There was nothing else to do but to keep climbing, so I endured half an hour of hail and freezing rain - and was awarded with this view from the summit. View from Western Spanish Peak, Colorado. Desert rainbow, Death Valley, California.